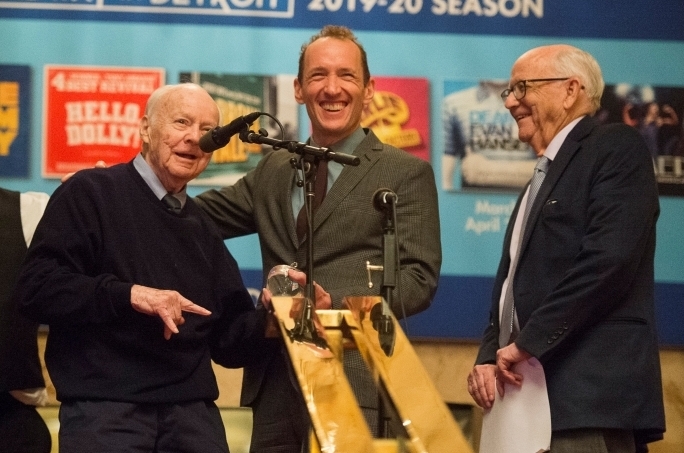 Joseph Nederlander and Robert Nederlander were on hand at The Fisher Theatre on Wednesday, March 27 to present HAMILTON Producer Jeffrey Seller with the prestigious 2019 Wayne State University Apple Award. The Nederlander brothers presented the award in front of an invited crowd of Nederlander and Seller family members and representatives from Wayne State University prior to the evening’s performance of HAMILTON. Oak Park native Jeffrey Seller thanked the Nederlanders and Wayne State University for the award while reminiscing about seeing his first Broadway musical, Shenendoah, at the Fisher Theatre. The award, named in honor of the Nederlander’s mother, Sarah Applebaum Nederlander, is presented by Wayne State University to a celebrated theatre artist. Past recipients have included Carol Channing, Elaine Stritch, Neil Simon, Stephen Schwarts, and many others. Award recipients visit Wayne State University to meet with current Theatre and Dance students as part of the Apple Award program. While in Detroit, Mr. Sellers also made an appearance at the Detroit Economic Club breakfast and hosted a post-show talkback with Hamilton Director Thomas Kail, and cast members for a Hamilton fundraiser for L!fe Leaders, Inc – a non-profit program founded by Amy Nederlander. Jeffrey Seller is the winner of four Tony-Awards for Best Musical: Rent (1996), Avenue Q (2004), In the Heights (2008) and Hamilton (2016). Jeffrey also produced and/or developed De La Guarda (1998), Andrew Lippa's The Wild Party (2000), Baz Luhrmann's direction of Puccini's La Bohème (2002), High Fidelity (2006), the Broadway revival of West Side Story (2009) and Sting's The Last Ship (2014). Seller, along with former business partner Kevin McCollum, created the first Broadway lottery for Rent, which, for 22 years, has been a popular way to see Broadway shows, often in the first two rows, at an affordable price. He is the only producer to have produced two Pulitzer Prize-winning musicals--Rent and Hamilton. Jeffrey was executive producer of the NBC Drama Rise (2018). He opened his new Broadway musical, The Cher Show, at the Neil Simon Theatre this past November. In addition to producing, he directed a new musical based on Jules Feiffer's young-adult novel, The Man in the Ceiling, at the Bay Street Theater and Fly at Dallas Theatre Center.